"Rotisserie chicken soft tacos made with homemade flour tortillas and pico de gallo." Heat vegetable oil in a skillet over medium heat; cook and stir chicken, chili powder, cayenne pepper, salt, and black pepper together in the hot oil until chicken is heated through, about 10 minutes. Spoon chicken mixture onto each tortilla and top with pico de gallo and Mexican cheese blend. 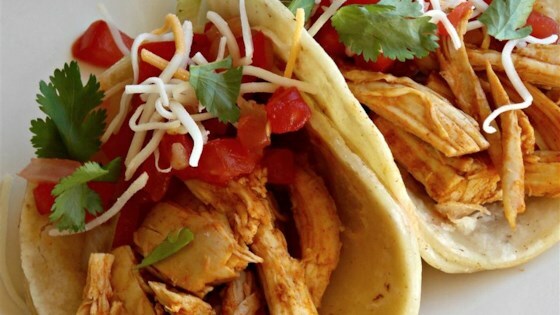 Check out these lime flavored chicken soft tacos. It was ok. We added the "usual" taco toppings as well (lettuce, avocados, sour cream, etc). These are so easy and need to go into the regular rotation. A great use for left over chicken. Excellent use of a leftover half rotisserie chicken. Thanks! I love this! It's easy & bursting with flavor. Everybody should try it. This is the first time I've had chicken soft tacos. It had a nice flavor to it. I might fix this again but probably doctor it up a bit more.